I’m sure many of you have seen this decal/sticker on cars of Christians. It’s a picture of a little kid praying in front of a cross. But if you know anything about comics and cartoons, you’d know that this isn’t just any kid, but Calvin from Calvin and Hobbes, created by Bill Watterson. I grew up on Calvin and Hobbes. They always have a soft spot in my heart. My brother, for a wedding gift, got me the the entire collection of Calvin and Hobbes. 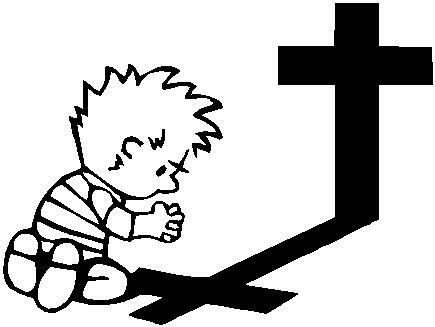 And any Calvin and Hobbes fan will tell you that the little boy praying in front of the cross is mosdef, Calvin, with his spikey hair and striped shirt. So, the Calvin praying sticker is on a lot of Christians cars. I saw two on my way to Starbucks just now. But here’s the thing that gets me. Bill Watterson spent a good portion of his professional life fighting merchandising Calvin and Hobbes in any shape or form. They are illegally using Bill Watterson’s work and making some profit off of it. So. What does that say? What does that mean? When you see a car rocking the praying Calvin decal, what’s your reaction to be? Oh. Cool. This guy’s a Christian! But, he doesn’t care about copyright infringements or anything like that. And what about these companies, presumably Christian companies, that sell these decals? Are we above the “earthly” law because we are to obey the “heavenly” laws, or something of that matter? Aren’t we sending some sort of mixed message (for those, like me, who know the history of this awesome comic strip), about prayer and illegally using someone else’s work? It really is a shame of how we Christians blatantly rip off things from “secular” culture. And, you know, some of these Christians also get bent out of shape when their ideas for ministries are used/copied. We have creative people that can do cool, original stuff. We don’t need to rely on ripping off people to make our presence known. Besides, I don’t think anyone really gets “saved” because of what they read on the back of your car. And. Remember, if you have Christian bumper stickers on your car, put one on your dashboard to remind yourself who you belong to as well. You have some interesting posts on your sight, thanks. As for this one, I think we all need to be careful that we don’t become “lifestyle police”. Just because we see someone doing something that we wouldn’t do, or for that matter, they shouldn’t do, doesn’t mean it’s our job to point it out. Jesus nailed this when He said “when you get your life to the place where you have NO sin, then and only then, can you go ahead and throw the first stone”. I emphasize the fact He said “NO” sin. He didn’t say “less” sin than the person you’re casting stones at. I just think there are gifted and talented Christian people out there, so that we don’t have to go and steal other people’s ideas. I don’t like it when pastor’s use other pastors’ sermons and never give credit to the original preacher. Did you get permission to post those two graphics? Thanks for clearing that up. I’ve always seen & admired those decals. Too bad they’re not licensed. My kids would have loved one on our minivan. We must keep the law of the land until it interfere’s with God’s laws; when it opposes God’s law, then we must take a stand for God and His laws. The first quote was Matt. 22:21. Please remove me from this email chain that you have going. Even though I did respond to something last June, it has been long enough that I don’t remember what it was about now. Thanks! I was looking around on WordPress to see how to unsubscribe from email notifications on comments. There is nothing I can do on my side. After googling, I think, in the email notifications you get from wordpress there is supposed to be an unsubscribe option. To clarify, this is not an email chain I have going and definitely NOT something that I signed you up on. Or bombarding you with. Commenters can choose to have emails sent to them if people respond to their comments.